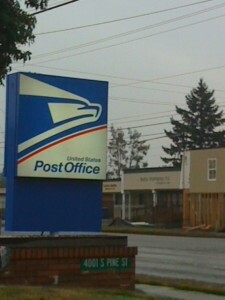 Today’s new place of the day, 9/15/10, was the Evergreen Postal Station in Tacoma near the Tacoma Mall. This post office stays open until 7 p.m. Monday through Friday and is also open from 9 – 3 on Saturday, making it convenient for working folks. Everytime I’ve gone in here, the employees have been effecient and friendly. This entry was posted in Government, Tacoma, WA State - Pierce County and tagged Evergreen, mail, Pine Street, Post Office, Postal Station, Tacoma on October 24, 2010 by admin.